How about Tjotafossen in Briksdal? As you head up the glorious Olden Lake past a dozen vey high waterfalls, the sublime view of the Melkvoll Glacier comes into view with the 1019 foot Volefossen. You approach this sublime area thinking there could be nothing finer, but WAIT!!! 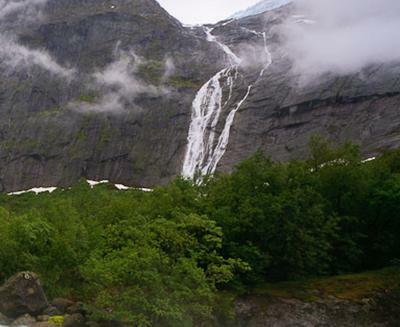 Following the trail up to Briksdal, you find the 2420 foot Tjotafossen just meandering down the bare gray cliff-face. I would throw that into the list (of Top 10 Waterfalls). FYI, you have it down on your Briksdal section as “Unnamed Waterfall”. It might be beneficial to change the name on your photo.